This article was published on 08-07-14. Local scientists and experts share five ways to lead a better life. With a wild grin and orange cowboy hat, flanked by women friends (her de facto bodyguards) in Johnny Cash-black and dark shades, the rail-thin blonde with the contagious laugh rolled up to the microphone and launched into her one-woman show Die Laughing With Cathy Speck. Over the next hours Speck—known by some in her hometown of Davis as the “queen of happiness”—sang, laughed, joked, blew bubbles and told stories about life, death and love so as to raise money last summer for her cause. Diagnosed in 2009 with a familial form of amyotrophic lateral sclerosis, more commonly called ALS, Speck has dedicated her life to raising awareness and funds for the fatal malady (also known as Lou Gehrig’s disease). It wasn’t the first time this woman had taken center stage as a local advocate for carpe diem. Since her diagnosis, Speck has hosted annual Specktacular Skydiving for ALS fundraisers (yes, she’s jumped); led boisterous teams of supporters on annual Sacramento ALS walks; and told her story to anybody who will listen, including multiple college and junior-high classes in the region. Last month, when doctors told Speck they had found a new medical issue with her lower intestines—a rare cancer had taken up lodging there—her response was classic. Why is this woman so happy? If Speck can exemplify happiness despite the severity of her circumstance, why can’t we all? 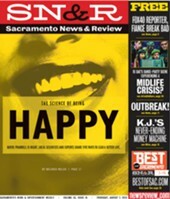 Seven years ago, SN&R published a story “The big happy” (SN&R Feature Story; August 9, 2007) that examined the relatively new field of positive psychology. Instead of obsessing on human failings and flaws as psychologists had previously done (think Freud), a new group of professionals suggested a shift in emphasis to what makes humans strong, gritty, resilient … happy. Thanks to pioneers like Martin Seligman, the renowned psychologist who wrote Authentic Happiness in 2002, an industry was born with its best-selling books, national summits and contentment gurus. Well, developments in the field have only accelerated since then. In fact, science has discovered that we humans can actually be taught many (sometimes unexpected) things about happiness. And who better than Speck to serve as teacher? Today, the science of well-being is booming and involves academics and scientists in disciplines beyond psychology—we’re talking neuroscience, sociology, medicine, economics and evolutionary biology. It’s no longer just intuitive that happiness and a positive outlook is good for one’s mental and physical health—now science also heralds the many benefits that can be accrued from looking on the bright side. Not surprisingly, technology has entered the mix with new positive-psychology tools. Happify is a digital app tool with “scientifically designed games and activities” that lets people regulate and monitor their emotions and behaviors. Another example: The Gratitude App for Google Glass encourages optimism and the expression of gratitude. Indeed, our scientific understanding of the brain (including acknowledgment that the brain actually can change) has doubled in the last decades. Neuroscientists have discovered, for example, that greater activity in the left side of the frontal cortex, is associated with positive emotions and increased happiness. “The science of happiness has blossomed,” concurred Emiliana Simon-Thomas, UC Berkeley’s neuroscientist who works as science director at the Greater Good Science Center. Simon-Thomas is one of a pair of GGSC instructors offering an upcoming free massive open online course, or MOOC, on the edX platform called The Science of Happiness. The class, which is still open for enrollment, launches on September 9, and has so far signed up a whopping 65,000 students. Simon-Thomas and others seem to largely embrace the idea, based on a meta-analysis of hundreds of studies from across the globe, that insights into happiness can be derived from a pie chart that’s divided into a 50-10-40 split. Though some consider the chart’s simplicity to be misleading, the schema breaks it down that 50 percent of happiness is determined by genetics, with findings based primarily on studies that track identical twins separated as infants and raised by unconnected families in different environments. Another 10 percent of our happiness quotient is due to life circumstance, which includes health and wealth. On the latter, multiple studies, including one by Nobel Prize winner and Thinking, Fast and Slow author Daniel Kahneman, have found that once people reach a modicum of financial security, pecuniary gains don’t increase happiness. Importantly, the remaining 40 percent of what makes up happiness seems to be determined by day-to-day habits, attitudes, activities, work and social relations. And that’s a sizable chunk. In the case of Cathy Speck, that 40 percent can be deconstructed, more or less, into five realms that coincide with much of what is being discovered about happiness: 1. Speck has a committed, loving and laughing network of friends and family members with whom she stays connected, physically and virtually; 2. she expresses gratitude naturally and constantly for what she calls “the whirled” and her spot in it; 3. she embraces a live-in-the-moment philosophy, practices mindfulness and turns to books about Buddhism if ever she feels blue; 4. she’s generous with her time and energies, especially as a fundraiser for her causes; and 5. she is passionately devoted to those causes and is fueled by the sense of purpose it gives her. Though thinking and behaving in a way that promotes well-being comes naturally to Speck, it seems “happiness benefits” can be amassed by any who choose to follow the science in these same five realms. To be a friend of Speck’s on Facebook is to belong to a far-reaching social network that seems keenly connected to this one woman’s irreverent sense of humor, passionate belief in speaking openly about “the life and death cycle,” and her particular diagnosis—ALS, which causes the body to slowly become paralyzed, with one muscle group after another ceasing to function. Now, this kind of share-everything transparency related to an illness or medical procedure may not be for everyone. But it’s endemic of Speck, who has chosen to live—and ultimately to die—in full view of her extended community of family and friends. “People tend to be happiest when they are with other people or with a community of trusted friends and family,” said Simon-Thomas. Multiple studies reveal that having close relationships, including romantic ones, are particularly beneficial. “Having people to confide in, who’ll lend support in times of trouble cannot be overrated,” she added. It often surprises people from industrialized countries when they travel and find that developing countries are full of happy people, she said. That’s because, in some Third World regions, the poor live in interdependent communities with tight-knit families and close social connections. Research in evolutionary history indicates that the American standard of rugged individualism may not actually offer the best path to achieving well-being, she said. UC Davis professor Robert Emmons, a psychologist and national expert on the benefits of gratitude, gets hyped up quick about the “new generation of researchers” that have entered the gratitude field. “Some of the findings are really amazing,” he said. According to Emmons, clinical trials show that the practice of gratitude can lower blood pressure, improve immune function and facilitate more efficient sleep. Additionally, it can reduce lifetime risk for depression, anxiety and substance-abuse disorders. “Gratitude is good medicine!” says Emmons. This author of four books (including Thanks! : How the New Science of Gratitude Can Make You Happier) and editor of The Journal of Positive Psychology makes a case that the expression of gratitude has a deeper power than ubiquitous smiley-face emoticons might convey. In additional to improved health, he says, feeling and communicating gratitude results in closer relationships and increased optimism—both of which are keys to happiness. We tend to get used to things so that good things become predictable and invisible, he said. The act of expressing gratitude helps overcome that adaptation and can be a watch guard against taking life for granted. From the social evolutionary perspective, said Emmons, research is demonstrating “that gratitude takes us outside ourselves where we see ourselves as part of a larger, intricate network of sustaining relationships. Both Emmons and Simon-Thomas, who oversees UC Berkeley’s Greater Good Science Center’s Expanding Gratitude Project, suggest individuals keep a gratitude journal, i.e., write down what one is grateful for and look back on it on occasions when inspiration and reflection is warranted. The history of mindfulness goes back to Buddhism, with its teachings that draw attention to the moment and advocate meditation, serenity, balance and effortlessness. It was 1979 when University of Massachusetts molecular biologist Jon Kabat-Zinn first brought Buddhist principals (if not its religious connotation) together with medical findings with his Mindfulness-Based Stress Reduction program. More recently, a pile of research has continued to document the psychological and emotional health benefits of practicing mindfulness. Health-care organizations like Kaiser Permanente and Sutter Health now offer programs and podcasts that promote mindfulness exercises to patients since these have been found to reduce stress and anxiety, ease chronic pain, reduce blood pressure and improve immune systems. “It’s about the here and now,” he said. According to Walker, you don’t have to sit in the lotus position and think higher thoughts in a formal meditation practice to derive benefits from mindfulness. The simple act of getting comfortable, focusing your mind on the present while gently pushing away distractions (perhaps while silently repeating a positive mantra or phrase) causes the body to relax, the breath to slow and the heart rate to drop. Interestingly, the practice of mindfulness also tends to makes people more altruistic. For some, the quest for happiness can seem selfish in a world overcome with the suffering of others due to poverty, war and violence. She admitted, “The heaviness of other people’s suffering can be overwhelming.” The best you can do, she said, is take on a mindset that “when you can do something, you will. “Acknowledge that you are concerned about the welfare of others and will make good choices,” she said, such as acting with compassion toward the people in your life, making sustainable choices for the environment, working for social change, etc. By the end of the show, she hadn’t. As Phoebe learned, it’s hard for generous acts to be selfless because accomplishing them makes you feel good. Indeed, this can be tracked because research reveals that our brains light up in areas associated with pleasure when we are kind to others. Could it be, for example, that spending money on others makes us happier than spending on ourselves? Elizabeth Dunn an associate psychology professor at the University of British Columbia and co-author of Happy Money: The Science of Smarter Spending, conducted a study that answers with a resounding “yes.” In it, participants who were randomly assigned to spend money on others experienced greater happiness than those assigned to spend it on themselves. In another study, published in the Journal of Personality and Social Psychology, scientists looked at data from more than 200,000 people from all around the world and found that donating to charity boosted happiness. Unpredictably, the finding was even true in countries where people had to struggle to put food on their own table for their own families. It’s surprising when Speck, the queen of happiness, describes her 25-year-old self (pre-ALS diagnosis) as severely depressed, with lots of problems. But it’s true. In her mid-20s, Speck was “alcoholic, anorexic and bulimic and suicidal … everything you can think of,” she said. Indeed, she spent her adolescence “funny and smart on the outside” but grieving on the inside after a mother who died when she was 13. When Speck came out as gay in the late ’70s (“when it was not OK,” she said), the young woman struggled to make her way. “That’s when all the sadness and anger and depression came that I had been hiding away,” she said. “I think that I’m so full of love and happiness now because I felt the darkness then,” she said. Speck’s sense of purpose is authentic and no doubt part of what’s kept her going despite it all. Indeed, research from Cornell University in Chicago found that purpose protects people against stress, a fact that likely explains why people with purpose live longer. What constitutes purpose is different for everyone. It can be self-focused, like achieving a goal you set for yourself at work. Or it might be simply making ends meet for your family or staying healthy so as to one day meet your wished-for grandchildren. Often, as with Speck, it means committing to a larger purpose or social cause that benefits the less fortunate or future generations. Science has recently distinguished between how “happy” and “meaningful” lives differ when it comes to physical health and a longer life. But for Simon-Thomas, the truth includes both words. “The best way to pursue happiness is through pursuing a meaningful life by committing yourself to a greater purpose beyond your own self-interest,” she said. Speck, now back at home recovering from her recent surgery, couldn’t agree more.